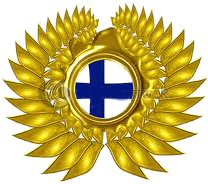 SO what I have gathered it is Finnish Tikkakoski M28 of the Civil Guard pre-1930 for 1930 starting approx. with serial number 30,000 the Sako gear symbol was starting to be used. It has a 26 inch barrel. It has no stock, bolt or front sight.I will post picture of it when I get a chance to take one again. Hmmm, is there 2 plugged holes in the receiver? It looks like at one time there was a scope mounted to it thus the crossed out numbers on the side. Marauder, I'd have to look. I have been out of town and busy so I don't remember if it has 2 plugged holes on the receiver. What would it mean? A former sniper rifle? The crossed out serial number on the side of the barrel usually means it was paired to a scope. I don't see any indications of wholes in the top of the receiver so the side would be the next logical place to look. Now that being said since this rifle is not complete it could be someone has pieced it together from parts. Oh I also didn't see a D stamp on the barrel indicating that it had been re-chambered to for Finnish ammo. I own an M27 and a M28/30 and they are both awesome shooters. OK went over those photos again with a fine tooth comb. There is what appears to be a D stamp on the barrel, however not where I would expect it to be. There are a couple of possibilities. I have no proof of these so take them with a gain of salt. It could have been started to be built as what has been termed a "sneak" rifle. That is not the proper term but that's what some call them. They were built in the 60's by the Finns' when they were not supposed to be building them. They had a lot of war time captured parts and built them as rifles for for officers.